Would you like to learn Japanese free of charge? We are giving away 30 hours of high-quality comprehensive Japanese audio lessons, together with a complete transcript. If you are having a difficult time trying to learn Japanese, it’s understandable. For people who think in English, Japanese is a very difficult language to learn. Aside from the inconvenient fact that written Japanese employs three different alphabets, the main reason that we have so much trouble when we try to learn Japanese is that Japanese grammar is fundamentally different from the grammar used in European languages. On the positive side, Japanese sounds a lot like Spanish, and it’s relatively easy to pronounce. It contains nouns, verbs, adjectives and adverbs, and there are reasonably logical rules that tie these elements together. It’s a fascinating language, and naturally you should try to learn Japanese if you will be visiting Japan. I’ve been studying this difficult language for over thirty years and have tried a number of courses, textbooks and study methods during that time. Based on my experiences, I’ve identified three keys that can help you to learn Japanese. KEY #1. Since time is limited, use these Japanese Audio Lessons to learn Japanese free. It will take quite awhile for your English-thinking brain to start thinking in Japanese. 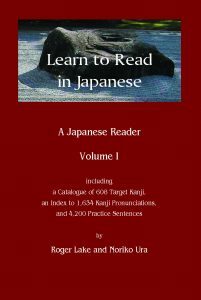 You will need to spend hundreds of hours reviewing phrases and sentences in order to acquire a reasonably firm grasp of basic Japanese vocabulary and grammar. Where will you find the time for this study? 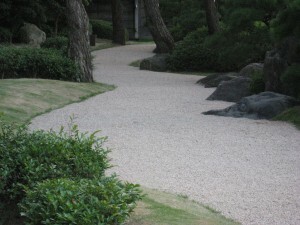 An excellent solution to the problem of insufficient time is to use Japanese audio lessons. Since audio lessons don’t require you to stare at a book or a screen, you can use them while you do other activities that you need to do anyway, like exercising and commuting. As a bonus, if you exercise more often while using them, audio lessons will help to keep you healthy. KEY #2. Use Mnemonics to help you learn Japanese. Japanese words can be hard to remember. Kuukou means airport. Kyuukou means express train. Koukou means high school. Koukuu means aviation. How can you help your brain to remember all of these similar terms? It shouldn’t take very long for you to think of simple mnemonics for most Japanese terms. If you get stuck, try using a dictionary or a search engine. Since mnemonics are just trivial things that you will typically discard after using a new word about ten times, they don’t have to be perfect. KEY #3. Use Active Recall as a tool while you learn Japanese. “Active Recall” means “learning by answering questions” or “flashcard learning,” and it’s a highly interactive, enjoyable and effective way to learn Japanese free of charge. Active Recall has been shown to be more effective for building strong memories, compared to “passive” study methods like reading textbooks or merely listening to audio recordings. Many people use flashcards, especially electronic flashcards, when they are memorizing difficult terms. If you haven’t tried flashcards, you may not realize how much fun they are, or the extent to which they can reinforce your memory. These Japanese Audio Lessons can be thought of as audio flashcards. Instead of employing written questions and answers, as paper and electronic flashcards do, they consist of audio questions in English followed by audio answers in Japanese. If you want to learn to Read in Japanese, check out our two books. While we’re on the subject of Active Recall, I should mention that we have prepared two books, Learn to Read in Japanese, Volume I, and Learn to Read In Japanese, Volume II, which are also based on the Active Recall learning method. In the books, the “questions” are written on the left side of each page as Japanese sentences, and students do their best to translate them into English. The correct answers are shown in a small font on the right side of each page. 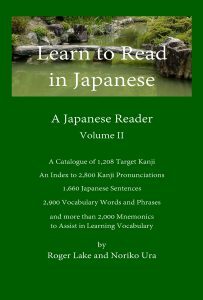 You can read more about our books on the How to Read Japanese page on this site. However, let’s return to our discussion of free Japanese audio lessons. Japanese Audio Lessons will help you to learn Japanese efficiently. After completing my third round of Japanese audio lessons, I needed to find another course that would allow me to continue to learn Japanese. Not finding anything suitable, I started working on my own interactive Japanese audio lessons with the help of my wife Noriko, who is a native of Kyushu in Japan. The Japanese audio lessons come with a complete transcript, which you can print and carry along as you learn Japanese free of charge. The transcript includes both Japanese text and romaji, and it is completely customizable. If you think of new mnemonics while you are using these lessons, you may add them to the transcript for future use. Since you will probably use these lessons during exercise periods and while you commute, you will soon begin to understand Japanese grammar and vocabulary at a basic level. If you refer to the transcript as you study, you will find answers to many common questions about the Japanese language. Next, read A Comparison of Three Japanese Language Courses . If you would like to leave a public comment, please use the “Leave a Reply” box at the bottom of the Comments page. To contact me privately, please use the Contact Form on the Contact page, or send me an email at administrator@japaneseaudiolessons.com.